The April showers did bring the May flowers, but then on May 7th we had snow showers! What on earth are they suppose to bring? I took pictures of it snowing, but it is difficult to see the falling flakes. 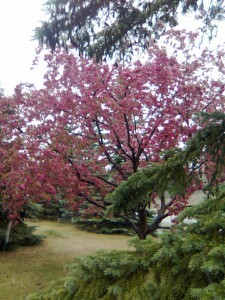 It was a very odd day to see all the crab apple trees in full bright pink bloom and large white fluffy snowflakes falling. This was a bit of a mind bender and just did not seem right! Hi mate. I really enjoy that writing and also your website all in all! Your write-up is extremely plainly created and easily understandable. The Wordpress design is wonderful as well! Would definitely be fantastic to discover exactly where My partner and i can download this. If possible maintain up the great job. We need a lot more this sort of website owners just like you on the internet and much fewer spammers. Excellent man!